Xiaomi has always been very inclusive of its fans, be it celebrating a milestone or a product launch. Now, on its seventh birthday, Xiaomi wants to give the love back to its fans through the Mi Fan Festival. 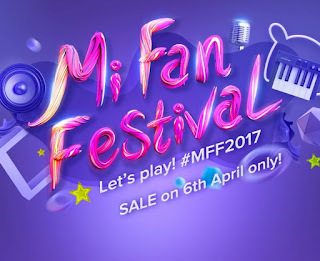 On April 6, 2017,Xiaomi Indiawill host a sales fest on Mi.com, where it will showcase some new products, along with discounts on its existing offerings. The sales and offers will include cash backs, Re 1 flash sales, and a fun speed-challenge based ‘Tap Mi’ game. How to Take Part in Mi Fan festival and Win Free Coupons & Redmi Note 4? • So signin using details and choose location : India . • Now there will be 6 Unlock games play the games and score high as much you can . • After the game you will be given a chance to draw , you can win Rs.50 Accessories coupon to 500. Lucky users will also get Redmi Note 4 On 6th April .